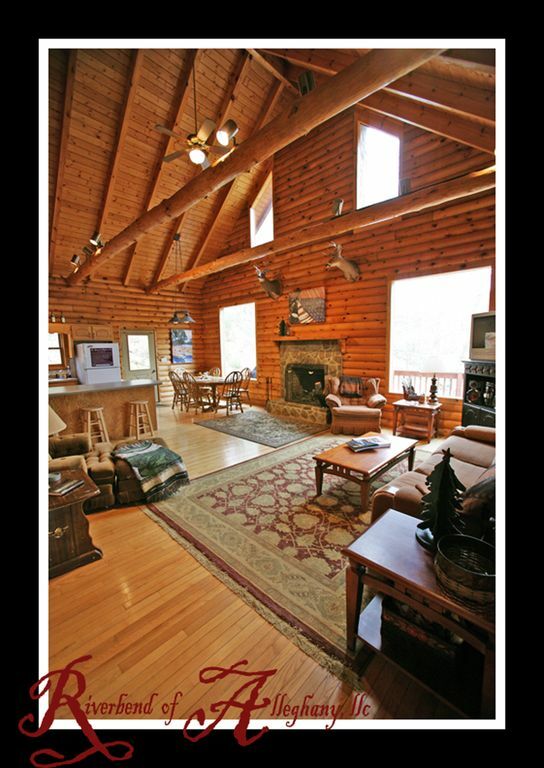 Rushing River 3 story Paradise on 20 acres -- Riverbend of Alleghany is an amazing place! Riverbend is a custom-made, three-story, 2,800 square foot(approx), Log Cabin Home located on a secluded, privately owned, wooded 20 acres right on the Little River in the Blue Ridge Mountains of North Carolina. Our 1,000 square foot bunk room with built in Swiss bunks, game room and french doors out to the river is amazing! Some properties have a great view and some properties have a great house but THIS PROPERTY has both. Don't settle for an average living space just to get the view or sacrifice the view to get a great living space. Get both! The house is gorgeous and the river and property are stunning. When you compare us to other rentals, ask them 'How much land do you have?' Most of the other rentals in the area have a thin strip of land. We own the 20 acres Riverbend sits and another 10 or so acres with another house in close proximity. We have hundreds and hundreds of feet on the water! When you compare us, ask the other property 'are you right on the river?' The river is our front yard! You'll just love Riverbend! Check out our video at riverbendmountaincabins.com. toilet, shower, This is the favorite of all who love showers! toilet, combination tub/shower, This tub is great for bathing little ones! toilet, jetted tub, The giant jetted tub is great after swimming in the river! We are right on the Little River. Watch our video at www.riverbendmountaincabins.com. The water front is unbelievable here. You must bring a calling card to make long distance calls. We have a fax machine with instructions if you need one. Parking is limited at Riverbend. Please use the area in front of the garage for parking. Giant plazma TV in bunk/game room and huge flat screen on main level. We have tons of family DVD's. Wrap around balcony on upper level with rocking chairs, picnic table and tables. Most excellent rocking porch over-looking the river. Slate paved patio on lower level with rocking chairs and tables facing river. This is a beautiful property with an attractive and wonderfully functional home. The house was especially well cleaned and stocked for visitors. The property manager was easy to work with and her information was helpful and complete. Our family has rented dozens and dozens of VRBO properties over the years and this is the first review I've written because this property positively stands out in every way. We are thrilled that you enjoyed your time. I usually call each guest after a visit and with the press of the holidays, I just didn't have a chance to call you. Thank you for blessing us with this review. We are so very grateful for the guests we've received over the last decade plus. Have a wonderful 2019. I've been to Rushin' River (aka Riverbend) a couple times now. The 1st time was for my bachelor party celebration, and the 2nd time was after the birth of my daughter, celebrating my 44th birthday. This is a great spot for folks who just wanna get away, grill, and sit by a firepit each night next to a crystal clear rushin' river. The cabin is great -- everything you need is there -- and there are wineries, canoeing, and hiking just a small drive away from the cabin. The love and passion surrounding this home will make you love it even more. Due to Hurricane Micheal we experienced some inconveniences from Mother Nature. The owners care and concern for her customers started at minute one. Beautiful family home with care, passion and love put into it. You’ll love the river and nature around this beautiful home. Kick back and enjoy a cup of coffee on the porch while you listen to the river flow. Thank you to the owner and caretaker for taking care of my family and friends during, before and after our stay. The peace and tranquility start as soon as you come around the sharp bend at the end of the lane and you see, and hear, the river right in front of you. The setting is a money shot - the house could be an army tent and the stay would be worth it. It's not a tent though but instead a charming log home with a front porch that makes it hard to go inside or leave the property. Our trip had a little extra excitement having been at Riverbend with threats of Hurricane Florence approaching NC. We were contacted by the booking folks (Susan) the property owner (Kat) and even got an in person visit from the property caretaker (Jack - a really nice guy) to let us know we might want to pay attention. The folks that look after this property were easy to deal with and totally focused on our enjoyment from first contact about booking. They were not intrusive but made sure we were aware of what was going on with the weather. The house was spotlessly clean and everything needed for a relaxing week was on hand. It's not cluttered with a lot of stuff yet has pretty much everything needed for a relaxing visit. One tip (NOT a complaint just a tip), if cooking is a big part of a getaway you might want to throw in a sharp knife or two and a favorite must have utensil. If this vacation rental has caught your eye for whatever reason, stop looking and just book it. You wont regret it. House and appliances were very clean- location was superb. As soon as we walked in the whole family said "We've got to come back!" - We'd not even unpacked the car! Very spacious and accommodated our every need. The tranquility of the riverside was unbeatable. Just for some advice- Bring what you need- you won't be "..... running to the store real quick"
What a wonderful property for our family and kids. The property is very accommodating to everything you need. The river is absolutely great for younger kids not being to deep but just enough current to have lots of fun on tubes and kayak. Fishing was great, no trout for us but we caught several other variety of fish. Really hated to leave this Vacation but sure glad we got to stay here. Thanks for sharing the wonderful place.